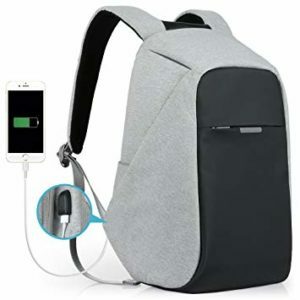 Top 10 Anti-Theft Travel Bags and Backpacks of 2019 | IsThatPlaceSafe? Traveling is definitely fun and exciting. Nonetheless, there are many risks that come with the territory – one of them being that you expose yourself to a high degree of unpredictability. At the same time, there’s also the risk of being robbed. 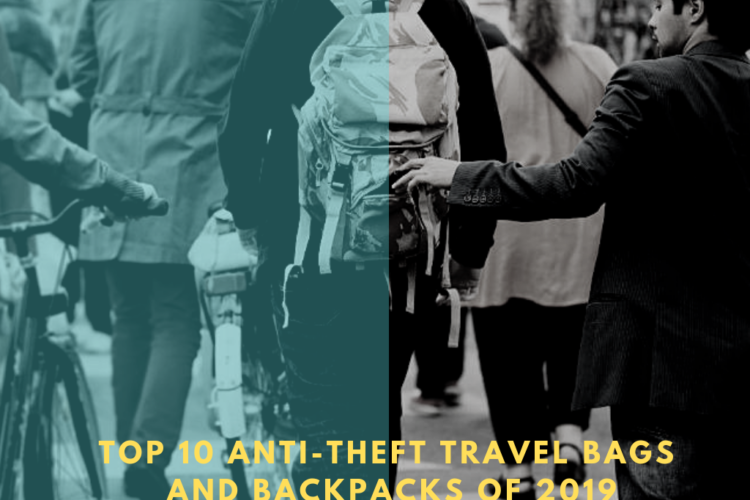 In general, this is the main drawback associated with the most popular traveling destinations – they are targets for opportunistic pickpockets. You might think that such things cannot happen to you, but the thing is that these pickpockets operate in groups, not to mention that they have far-reaching experience. Hence, the sensible thing to do is to take the necessary precaution measurements so that you can reduce the likelihood of being a victim. This is why today we’ll discuss about the best anti-theft bags. At the same time, we’ll also discuss about the must have features of an anti-theft bag, among other quintessential elements. To start with, this backpack is an excellent option, not only for traveling, but also as a city bag. In fact, its versatility is, without a doubt, one of its main strengths. As you can see, it is manufactured by a reputable company, which is a testimony to the product’s reliability and durability. This particular product offers an excellent combination of anti-theft bag characteristics. 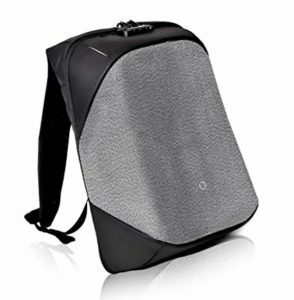 More specifically, the backpack and the backpack straps alike are embedded with sturdy, stainless steel wire. Aside from that, each individual section features a lockable zipper. Hence, this will significantly diminish the likelihood of having something stolen out of you backpack. In the meantime, it’s also worth outlining that the straps come with turn and lock security hooks. These make it really easy for you to look your bag down, granted that you’re at a train station, a restaurant, so on and so forth. In regards with the capacity of this backpack, it is quite spacious – having a capacity of 25 liters. 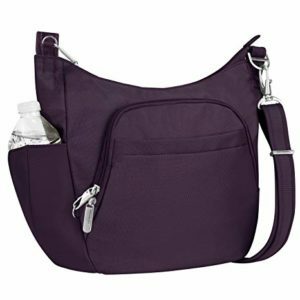 Hence, it can effortlessly accommodate a laptop, a camera, an extra sweater, and other necessary things you might need throughout the day. 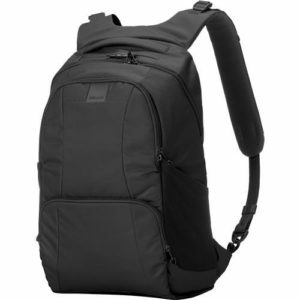 One of the best Travelon bags is definitely this specific backpack, which is a great option for men and women alike. 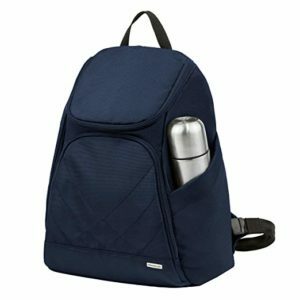 The unisex design makes it a worthwhile purchase, meaning that you can get this backpack and the entire family can use it whenever. So, what makes it so great? Both the body and the straps of the backpack feature an anti-slash construction. This is, without a doubt, reassuring, maximizing the durability of the backpack. At the same time, both compartments incorporate lockable zippers. On the other hand, though, there are two individual side pockets which aren’t lockable. So bear this in mind. Another characteristic worthy of your attention would be that this backpack is also organized in a way to make your life easier. There are a bunch of internal pockets that allow you to organize your things as you please, as well as a RFID pocket. On a different note, though, you should know that this backpack isn’t necessarily a good option for taller people. We would much rather recommend it to shorter people, as the straps are a bit on the short side, in comparison with other products on the market. All in all, this is a decent option for sightseeing; the minimalist design is versatile, being big enough to fit most of your essentials. Without a doubt, Pacsafe bags are amongst the most reliable ones when it comes to the safety features they come with. To that end, if you want to enjoy a high degree of security, this item is undoubtedly worthy of your attention. That’s because it has the best anti-theft characteristics, as you can see below. Also, another highlight is the fact that it is lightweight. This makes it a good option for your daily commutes or for traveling. Plus, it easily incorporates a laptop, which makes it double practical. All these features make it one of the very best anti-theft backpacks. In regards to the way in which it is designed, this item is made with the needs of the traveler in mind. In other words, it genuinely combines all the characteristics you would expect: namely versatility, practicality and spaciousness. Plus, the padded shoulder straps are great, as they contribute to the even distribution of the weight. Say goodbye to sore shoulders! The only drawback we could think of is that the water resistance element could be improved. 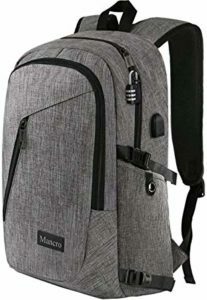 This backpack is another decent choice if you want to get a spacious backpack at a fair price. The timeless design makes it appropriate for literally any age category. To that end, this can be worn as a business backpack, as a school backpack or as a traveling backpack. This definitely makes your acquisition worthwhile, doesn’t it? It is large enough to accommodate your laptop, which means it is practical as well. Plus, it also comes with a built-in USB charger outside, as well as a built in charging cable right inside. This characteristic is, of course, really convenient, allowing you to charge your phone while being on the go – perfect for traveling or commuting! Moving on to the build of the backpack, it is made from durable, eco-friendly nylon fabric. At the same time, the material is water-repellent, which should come in handy in case of humid weather. Note, however, that water repellent doesn’t equal waterproof. In the case of abundant rainfall, this material will eventually get wet. With that in mind, this backpack might be a better alternative for commuters, as opposed to travelers. That’s because there are other items on our list whose anti-theft bag features are more efficient. Measuring roughly 20 x 5.5 x 11.8 inches, this bag gives you plenty of space, so that you can easily accommodate what you need during traveling. When visiting a new place, you would need your backpack to hold a camera, perhaps an extra sweater, some water, your documents, and some other things. This backpack is really spacious, making it a good option in this view. Aside from that, the straps are padded, which means you won’t be dealing with back pain after wearing this for a day or two. With that said, if you’re worried about experiencing back pain while wearing a backpack, this might be worth considering. In addition to that, we’ve noticed that the material has a nice quality. Evidently, the anti-theft features add up to the list of advantages. The same can be said about the convenient USB and headset port design. The thing is that this may look a bit dull, according to some people. But that’s a matter of preference, of course. Moreover, this is a compact, handy backpack, featuring a unisex design. We really like the clear-cut lines and the minimalist characteristics. We also find it suitable for a wide range of applications – including traveling, commuting, school, business, and the list could go on. So, if all these things are on your list, then, this might be the right product for you. Note, however, that this is quite compact, holding roughly 12 liters. To that end, if you want a lager backpack, you should choose a different item from our list. Moving on, the main compartment features multiple pockets, allowing you to maintain your things organized. More specifically, there is a designated space for your phone, for your notebooks, or even your laptop. Still, laptops larger than 15 inches won’t fit, so bear this in mind. On the other hand, though, wearing this for many hours might be quite uncomfortable. Plus, once the backpack is full with stuff, the zippers won’t remain hidden, as they are originally when the backpack is partially full. It was difficult to choose only some of the many Travelon bags on the market, as all of them offer an excellent mix of characteristics. But this specific model is, without a doubt, one of their best-selling models, and for good reason. Let’s present them briefly – shall we? This bag is quite large, even if you might not think so when you first look at it. In fact, it is spacious enough to accommodate your basic stuff while traveling. Of course, if you intend to carry your laptop and an extra sweater, you should choose a backpack instead. But if you prefer a bag, this one is a decent pick. 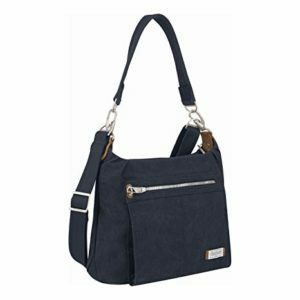 It has a classic appeal, meaning that it could easily pass as a fashionable bag – especially if you’re into wearing casual clothing. Moving on, another characteristic worth noting would be its durability. This bag is actually made from stain resistant 900 D. polyester, featuring nylon lining. This makes it easy for you to maintain it in top condition. Plus, other distinguishing elements would be the slash-proof locking characteristics, together with the RFID blocking technology. What do you know – another Travelon bag, but this time, the design is a bit different. Aside from the minimalist style, though, the main appeal of this bag is its anti-theft specifications, of course. The entire bag is made from slash-resistant material, which significantly reduces the likelihood of getting your valuables stolen. This is not all, as you might expect, the shoulder straps feature embedding, not to mention that you can lock the zippers, which further aims at optimizing your safety. As you can see, there’s no joking when it comes to these bags – quite the opposite. Most important, this is a useful, practical bag, which doesn’t scream tourist from a far-off distance. This is one of the reasons why it’s great for sightseeing and trips – especially if you plan on taking the bus or the train. In addition, this is a durable bag, even if it accounts for a notable upfront investment, it is definitely worth it, as it can withstand some wear – we’ve tested it so we know what we’re talking about. Furthermore, if you’re into wearing crossbody bags, then, this would definitely fit into your collection, being your go-to for your traveling adventures, and not only. The thing is that we are exposed to pickpockets and criminals on a regular basis, not only when we travel. To that end, investing in such a bag doesn’t mean you will use it exclusively during your travels, but on a day to day basis as well. And the good thing is that it is made from durable material. To that end, you can use it for many years to come and it will still preserve its original characteristics. This is what you get when you choose a well-made product produced by a reliable manufacturer. In addition, when you’re at a café or a restaurant, you can fasten the strap around an immovable object, so that you can have peace of mind and still enjoy your coffee or meal. Of course, the main compartment of the bag comes with RFID blocking technology, so that no criminal can steal your private information. This is an excellent option for anti-theft laptop bag, if that’s what you’re looking for. It looks great: minimalist and simple, you cannot possibly go wrong with it. It is a suitable bag for men and women alike. Hence, if you are looking for the perfect bag for your traveling adventures, which would accommodate your laptop and, at the same time, protect it, here you have it. A unique characteristic is, without a doubt, the weight reduction system, which aims at distributing the weight evenly, so that you don’t end up dealing with sore muscles. More specifically, the ClickPack will hug your back, meaning that you might not even feel the weight as you’re carrying it! Sounds pretty good, doesn’t it? On top of that, there are numerous hidden pockets you will certainly find handy. You can use them for documents, plane tickets, and the list could go on. There is also a hidden pocket that is perfect for attaching your key chain. In addition, there is a separate compartment in which you can easily accommodate a battery pack. In a nutshell, this bag is practical as it is durable. By only looking at it you can tell that it’s going to last for years. Now, before we move on to presenting our anti-theft travel bag reviews, we will answer a commonly met question – namely what is an anti-theft bag. As the name already entails, it is quite clear that an anti-theft bag is meant to eliminate the likelihood of being robbed, right? Notwithstanding, how do they do that? For one thing, such a bag incorporates a specific kind of technology. But that is not all, though; an anti-theft bag has individual characteristics that make it infinitely safer than its counterparts. This is what makes it ideal for traveling. That’s because, when you travel, you have to carry valuable items with you round the clock, not to mention that pickpockets may be lurking all over the place. 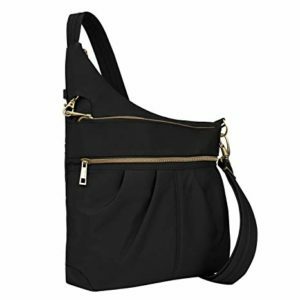 When researching the marketplace for top anti-theft bags, you ought to know what to look for. This makes sense, doesn’t it? With that said, we’d like to outline what to look for. In this way, you’ll get your money’s worth by purchasing an item that will definitely protect you from opportunistic pickpockets and thieves. Did it ever occur to you that some thieves have access to the technology that can scan your official documents even if they are inside your bag? That’s right. And it can be quite scary, to be frank. This is what makes it primordial for anti-theft bags to be equipped with RFID blocking technology, which aims at addressing this issue. Note that each credit card you own has an individual RFID chip, which incorporates your personal information. Hence, if you want to get a reliable anti-theft bag, make sure you put this on your list of priorities. Moving on, even if your bag has sturdy zippers, this doesn’t mean that a pickpocket won’t get access to your personal belongings. That’s because thieves and pickpockets – especially those with far-reaching experience, are sneaky. Plus, they have their ways of reaching your personal belongings without you even noticing it right away. Hence, in order to make it really difficult for a thief to unzip your purse without your knowing, then, the anti-theft bag you get should have high-quality zippers. That’s not all, though; the zips should also be lockable, for an ounce of extra protection. Moving on, another must-have characteristic of the best anti-theft travel bags is that of reinforced steel straps. The reason why it’s important for the straps to be reinforced is because this will prevent potential thieves from easily slashing the strap. You should know that this is a popular tactic used worldwide by pickpockets. Did you know that the manufacturing material of the backpack or bag matters just as much? Yes, you’ve read that right. Many thieves slash through the material of the bag in order to dumb what’s inside out the bottom. So, it is crystal clear why you should pay attention to this detail as well. Furthermore, whenever you’re traveling you should always pay attention to where you position your bag. Still, this doesn’t apply to traveling exclusively. For example, when you’re dining at a restaurant, it is strongly advisable to avoid placing your bag over the back of the chair. This makes it like an open invitation to potential pickpockets. With that said, this is why some anti-theft bags come with a special locking mechanism. This allows you to attach a bag to a specific object – such as a chair, so that no one can take it without your knowing when you’re not looking. And lastly, the way in which the bag is compartmentalized matters just as much. Not only that this will make it easier for you to organize your belongings, so that you can find what you need on the spot, but this comes in handy for safety reasons as well. To that end, special compartments for your documents, as well as for a laptop, are definitely more than welcome when it comes to top anti-theft backpacks and bags. Next we’d like to move our attention on the top anti-theft bag brands in this competitive industry. Evidently, there are many reliable manufacturers that produce high-quality items. But there are some brands that distinguish themselves from the rest. In fact, if you have a look at our table above, you’ll see that the names of some brands are repetitive. We’re referring namely to Pacsafe and Travelon. It was difficult to choose only a couple of products manufactured by Travelon – most of their bags and backpacks are worth the purchase, as they indicate excellent craftsmanship and high-quality construction, among other things. In fact, their line of products surpasses 400 different items. To that end, you will most likely find something of excellent quality, according to your individual specifications. This company has over 20 years of experience in producing anti-theft bags. Without a doubt, experience is one of the most important characteristics that make a brand successful. With the passing of time, a company has the possibility to embrace development and growth. This is the case of Packsafe bags, a firm that is dedicated to producing state-of-the-art bags that you can take on all your adventures. So, what differentiates these bags from others? In essence, they come with quintessential security characteristics such as pop and lock security clips, turn and lock security hooks and locking cables. These features make the world of a difference in regards with safety. 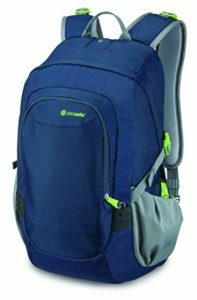 In summary, these are our top recommendations for the best anti-theft backpacks and the best anti-theft bags. We tried to include a diverse range of products, so that you could find something appealing to your taste and needs, of course. 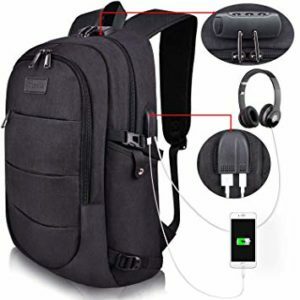 However, if you want a decent anti-theft bag, the first thing you should consider is, essentially, its anti-theft characteristics, as we’ve already pointed out. Only afterward should you factor in details such as style, construction, so on and so forth. An anti-theft bag can be a really practical acquisition. Not only that it will make you feel safer whenever you’re traveling to new places, but it will give you peace of mind. What is better than that? This is immeasurable, for sure. Thank you for reading this far! Which of the items in our list seems like the right option for you? Let us know!